Birthed by post-election funk, Bleed & Burn is a catalytic flag-making exhibition/action. This exhibition is a response to the crass, misogyny, racism, xenophobia, and other base instincts that got expressed during the election, and are now exemplified in the president-elect and his cabinet of horrors. 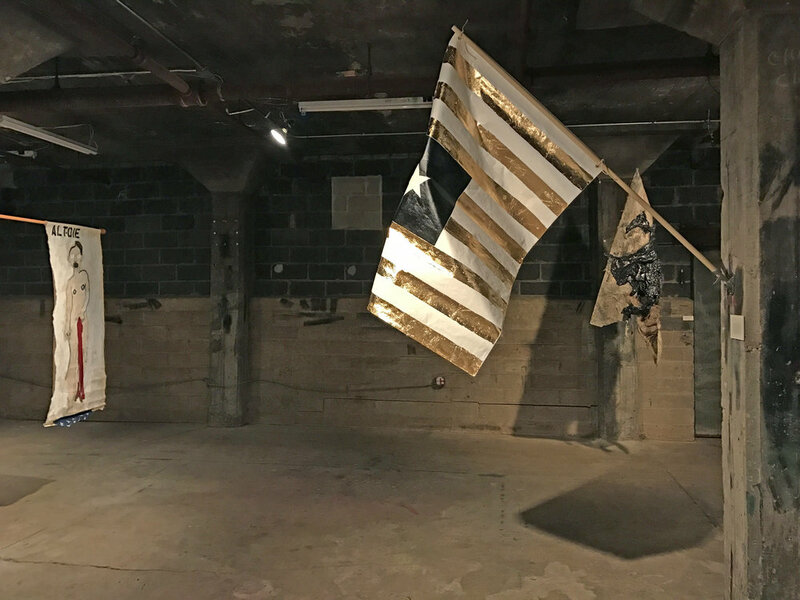 Thirteen artists will create twelve, standard-size flags that will be exhibited in the basement gallery of The Soap Factory, January 14-21. Each flag will in turn be burned independently by each artist at a location of their choosing (post-exhibition). The flags and documentation of each burning will be made into a book published at Beyond Repair, book shop and publishing site located in the Midtown Global market, 920 E Lake St, Minneapolis. A flag-making workshop will take place at Beyond Repair, January 15, 2017, 12-4 pm. Burning a flag is considered “symbolic speech” and protected by the First Amendment of the United States Constitution. Citizens are invited to make their own, small flags with personalized statements, to be burned independently in protest and ritual invocation.